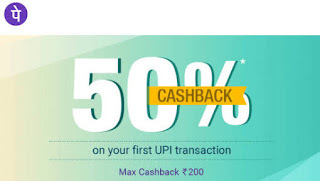 PhonePe App – Get 50% Cashback on First Prepaid Recharge. PhonePe is back with an awesome deal and offering 50% Cashback on Prepaid Mobile Recharge (Maximum Cashback is Rs 50). Offer is applicable on customer’s first prepaid recharge on PhonePe. Valid for once per user. So Hurry up and avail this Offer Now !! 10) You will get the 50% Cashback upto a maximum of Rs 50. 2) Offer is applicable on customer’s first ever prepaid recharge on PhonePe.